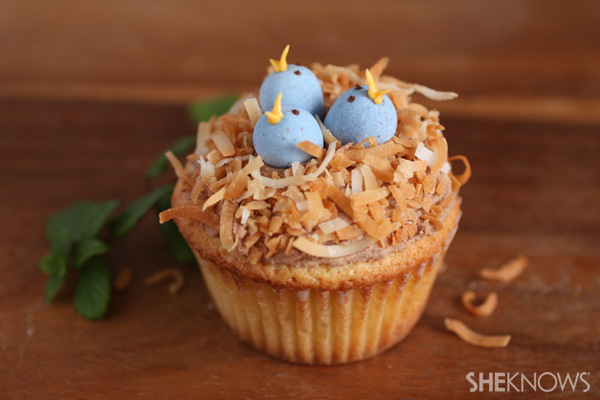 Spring is in the air, and these birds’ nest cupcakes show it. They are a delightful dessert to give or to indulge in yourself. The triple flavor combination of vanilla, chocolate and coconut is divine. Cupcakes are the perfect treat for any occasion. They’re quicker and simpler to prepare than a layered cake, and their individual serving size makes for easy cleanup. Another great thing about cupcakes is that almost everyone likes them. They’re made to please a crowd, especially when properly decorated. 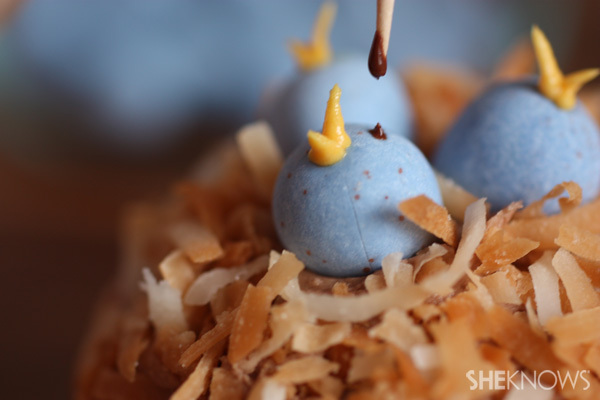 The following recipe is for moist vanilla cupcakes topped with chocolate frosting and decorated with melt-in-your-mouth chocolate Cadbury egg candies and toasted coconut. You’ll have cupcakes that you and those lucky enough to enjoy them are going to remember. Prepare the cupcakes according to the directions below. Allow the cupcakes to cool completely. Toast the coconut by preheating an oven to 350 degrees. 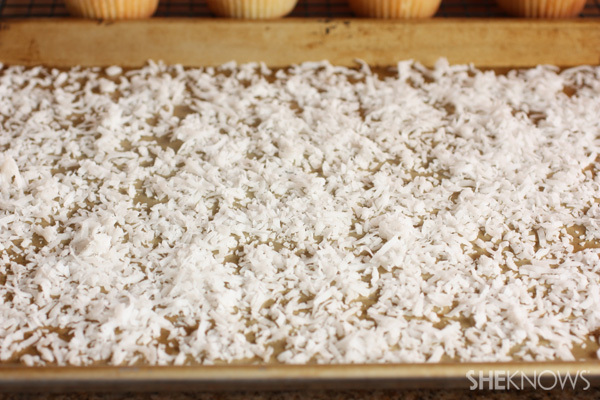 Spread the coconut onto a cookie sheet and bake it in the preheated oven for 8 to 9 minutes, until golden brown, rotating the pan halfway through baking and watching closely to prevent overtoasting. Allow the coconut to cool. Prepare the chocolate buttercream frosting, as well as the orange-tinted frosting for beaks, according to the directions below. Frost the cooled cupcakes with the chocolate buttercream frosting. 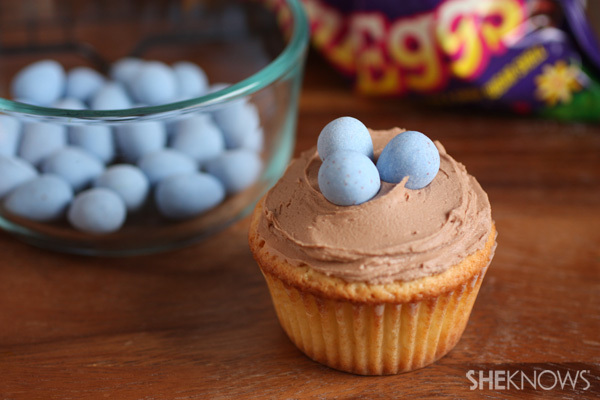 Gently press three blue Cadbury Mini Eggs into the center of each cupcake with the pointed end facing down (the larger rounded side should be facing up). 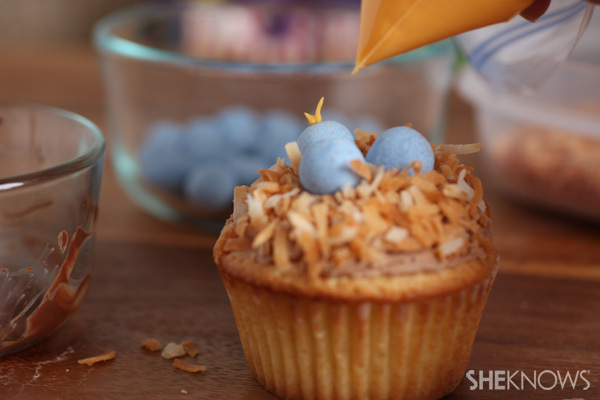 Sprinkle toasted coconut around the Cadbury Mini Eggs on each cupcake (try to work quickly doing this — before the frosting sets up — so the coconut sticks better). Melt the chocolate chips in a microwave-safe bowl in the microwave in 20-second intervals, stirring after each interval until they’re melted and smooth. Using a toothpick, paint eyes onto the chicks with the melted chocolate. Store the cupcakes in an airtight container. Enjoy! It’s likely you’ll need to purchase two 10-ounce bags of the Mini Cadbury Eggs if you want to have only blue chicks. Otherwise, if you want to purchase only one bag, you could make half blue and half pink (or yellow or white). 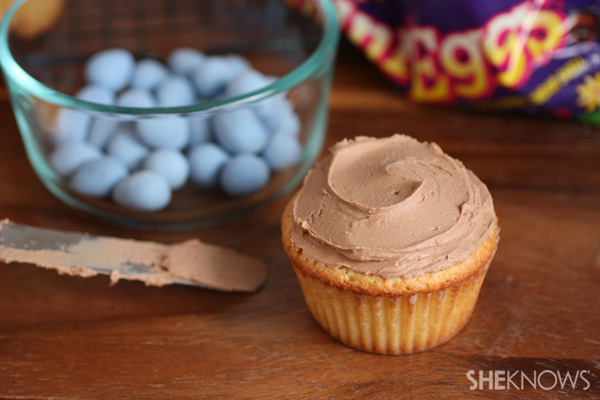 There are usually enough blue eggs from one 10-ounce bag to make seven to nine cupcakes with blue chicks. Preheat the oven to 350 degrees. In a large mixing bowl, whisk together the flour, granulated sugar, baking powder and salt. Divide the mixture evenly among 12 paper-lined muffin cups (they should each be about 2/3 full). Bake cupcakes for 20 to 25 minutes, until lightly golden and a toothpick inserted into the center of the cupcake comes out clean. Allow cupcakes to cool completely before frosting. In a large mixing bowl, using an electric mixer, whip the butter until smooth and fluffy. Blend in the powdered sugar, cream and vanilla, and mix until light and fluffy. Add the cocoa powder to the remaining nontinted frosting mixture and, using an electric mixer, whip until well combined.